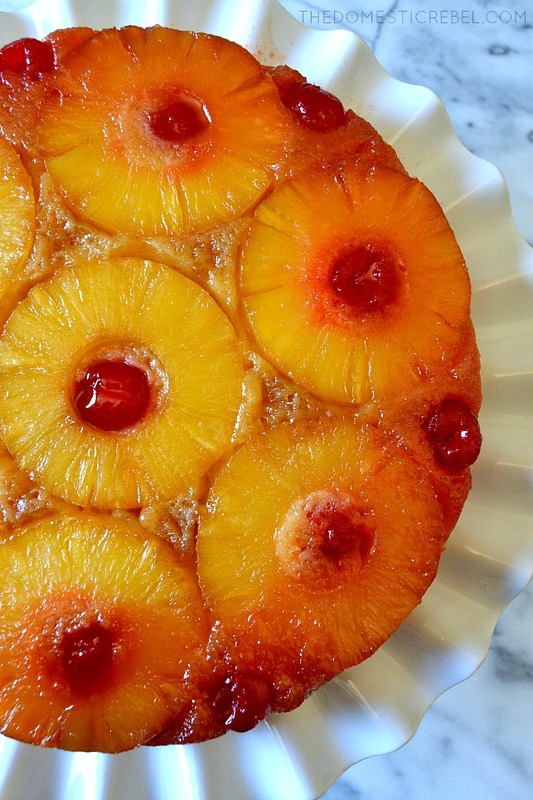 A retro recipe that’s here to stay: this Pineapple Upside Down Cake is AMAZING. 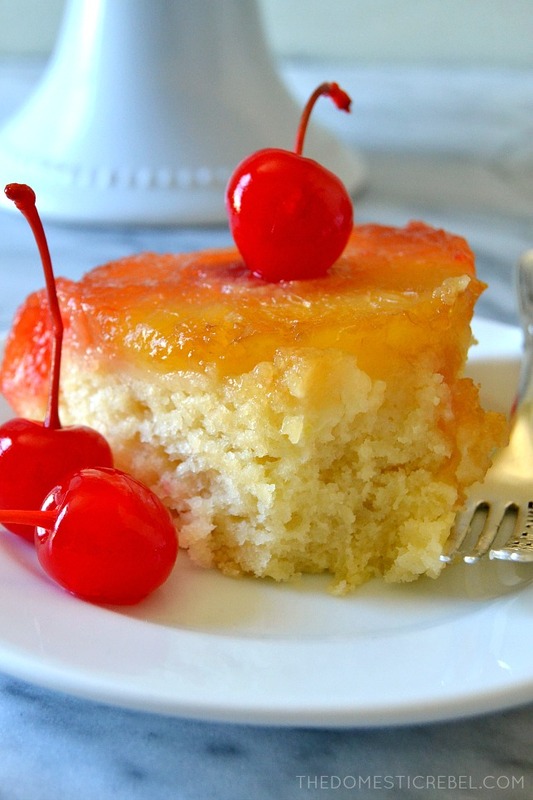 So supremely moist and soft, with a caramelized pineapple and maraschino cherry topping, it’s perfect for get-togethers, BBQs, potlucks, and any occasion! You guys – this cake! 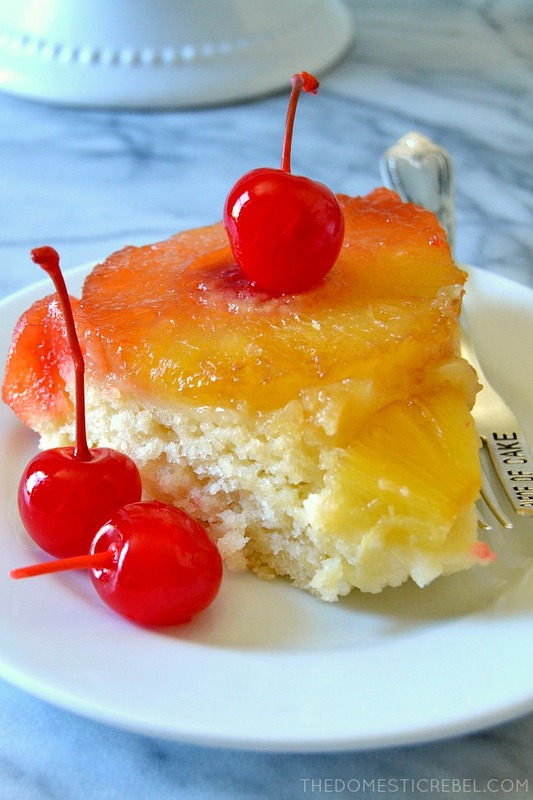 I’ve been tinkering around with pineapple upside down cake recipes lately and I had yet to find one I liked. For some, the cake was a little too dry – others, there wasn’t enough pineapple flavor or general pizzazz. I even found one recipe on the internet using dried cranberries in place of the maraschino cherries which is a crime against humanity and threatens the welfare of the world. Yeah, they’re neon red and full of sugar, but maraschino cherries are essential for this cake! But after some trial and error – and pawning the guinea pig cakes to my apartment complex’s front office – I have found The One. And like when you find your human soulmate, I found my cake soulmate and this is it. The cake part of this phenomenal piece of heaven is so supremely moist, fluffy and soft with a hint of pineapple flavor. The topping/bottom of the cake is just perfect: gooey, caramelized brown sugary pineapple slices and juicy cherries. The only thing that may be missing from this cake is a heaping scoop of vanilla ice cream. Just sayin’. Whatever you do, promise me you’ll make this cake and love me forever? 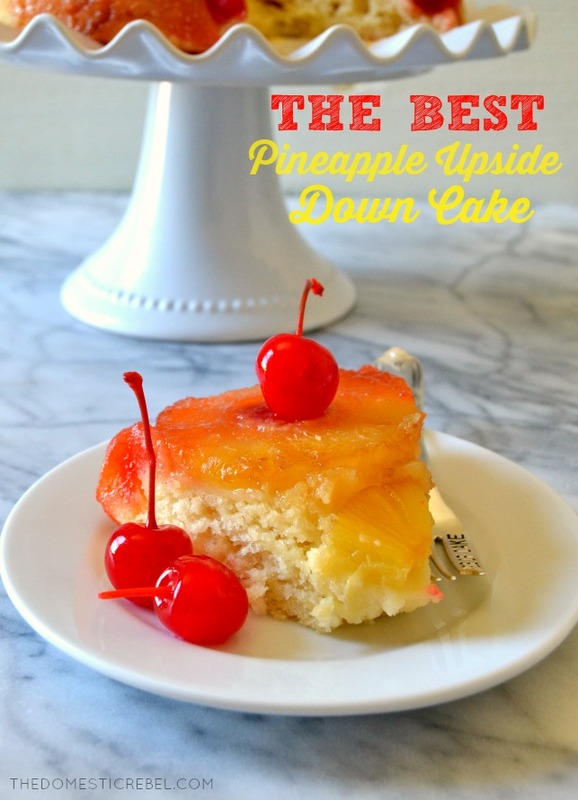 This Pineapple Upside Down Cake is the BEST recipe I've made and tried! 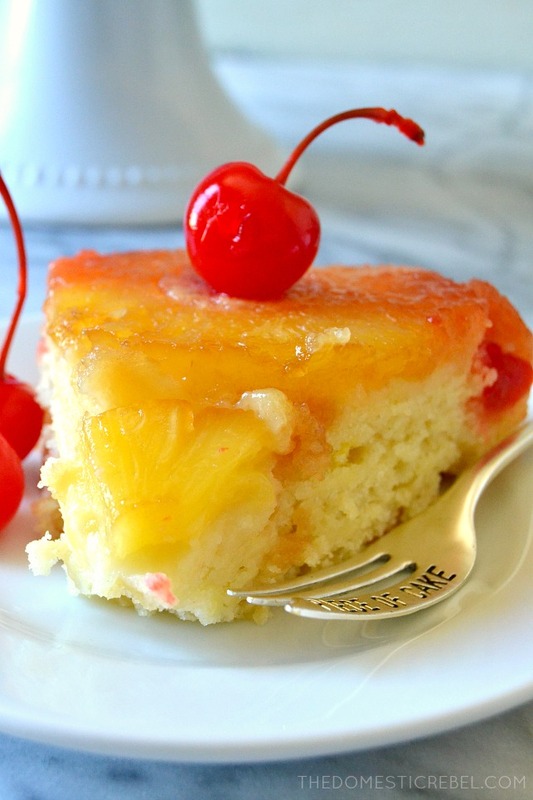 The cake itself is moist, soft and tender with a fresh pineapple flavor, and the topping consists of caramelized pineapples and maraschino cherries for ample flavor! Preheat your oven to 350 degrees F. Lightly grease the bottom and sides of a 9" round cake pan with cooking spray. In a small bowl, combine the melted butter and brown sugar and pour the mixture into the bottom of the cake pan, spreading it out evenly. Arrange the pineapple rings around the pan and place maraschino cherries in between. Set aside briefly. In the bowl of a stand mixer, cream together the oil and granulated sugar until moistened. Beat in the egg, salt, baking powder, and vanilla until combined. Beat in the sour cream. Gradually add some of the milk, alternating with the flour until a soft batter comes together. Gently beat in the pineapple juice last. Carefully pour the batter over the pineapples in the pan, careful not to disturb their placement. Bake for approx. 40-45 minutes or until the cake appears set, is light golden brown, and a toothpick inserted near the center comes out clean or with moist, not wet, crumbs. 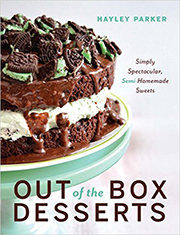 Cool for 10-15 minutes, then very carefully invert the cake onto a platter or plate. Serve warm or room temperature. I made this cake a couple weeks ago and I have had an actual dream about it since then – it’s that good. It’s a classic for a reason: it has that iconic look and inimitable flavor! Looks like a fine specimen indeed, my friend. You sure know how to sell a cake! I got curious to try it even before actually reading the recipe!! My weekend just got a new goal: to make this cake! Sean, this cake was so amazing! I have made it twice since posting this recipe because it is my new favorite! I made this cake in my cast iron skillet this weekend and it was DELISH! Fairly simple to make as well. I will definitely be making another again very soon. Made this today in cake pan. Came out beautifully. I wasn’t sure it would do without my iron skillet which I no longer have. . Will be making again. A long favorite in our family. Thank you for the recipe. 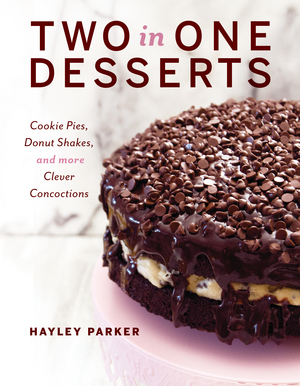 Have you ever tried doubling the cake? I need enough for about 20 people. Probably best to make two cakes but thought I’d ask. Hi Stela, I would make two separate cakes! Thank you for sharing your recipe with us, I made it today it’s cooling now my husband and i will be having it for dessert! Will update on taste later. This cake was awesome, delicious,and moist! This cake was moist and delicious! 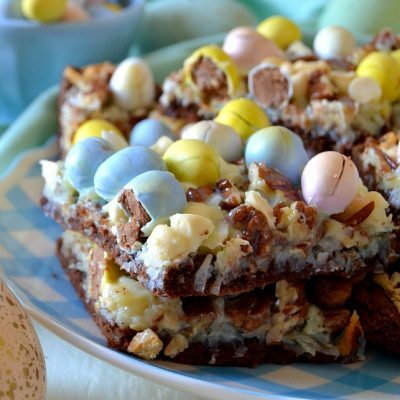 Can you make this cake in a 13×9 inch pan? Yes! You’ll need more pineapple and cherries, however, and the cake may be thinner. Thanks for the amazing recipe! This was my first attempt at a pineapple upside down cake and your recipe helped me knock it out of the park! Very moist, excellent flavor on the crust, and the flavor was not overbearing. I’m making it again asap! So glad to hear that, Ashley! Is there a reason I couldn’t just double? A 9” round is much smaller than a 9×13” actually it’s just about double. If I stayed with the above measurements the cake would be very thin. Agreed. I’m going to double the recipe. Made this for my mom who is a pineapple upside down lover. It was the “best pineapple upside down cake” she’s ever had. I also loved it and will never use another recipe again. Thank you! Bianca, I am so glad you and your mom loved it! Thank you! Hayley! This cake is so delicious! 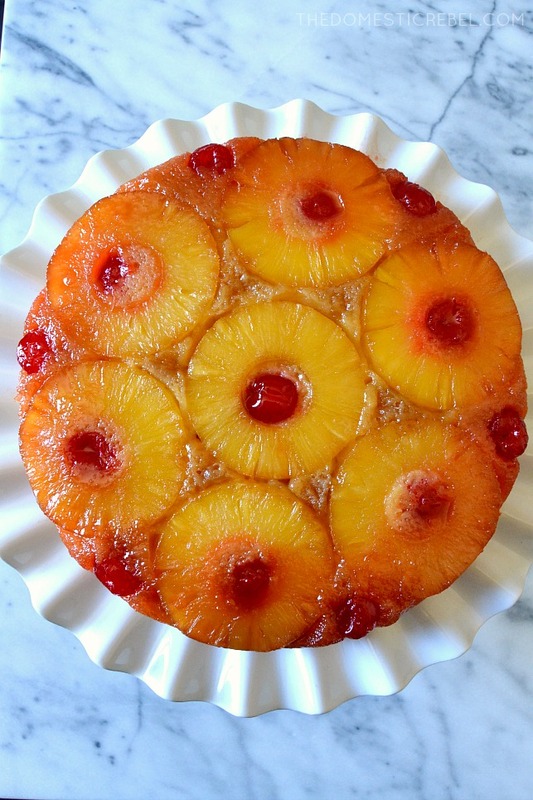 My husband has been begging me for a pineapple upside down cake for years. My last attempt with another recipe wasn’t so great. But, this! It’s moist, dense, yet light and the batter smelled amazing. I think i will add a little rum extract to the butter/sugar mixture next time! The recipe is amazing!!! I have made it several times! I love it!! Thanks for sharing it! Cake is in the oven as I type! Made it for my husband’s birthday. It’s his faforite…hope he loves it!! This was my 1st time ever making this cake and not only was it super easy but this cake was very moist and super tasty!! Will make again for sure! Made this yesterday and it’s gone today. Very good cake, moist and delicious. Followed the recipe exactly and extremely pleased with the results. Glad to hear you loved it, Marcelle! Hello! I’m going to be making this most likely next week! Can you make it in a bundt pan or do you suggest a flat cake pan? Hi Emma, I have not tried this in a Bundt pan, so I would probably stick to the flat cake pan!